“Everything we do here is a creative act, the opposite of monolithic!” Thus Marc Kent, the man whose vision – even more than his winemaking skills – has been the crucial, continuing element in building Boekenhoutskloof from virtually nothing in 1994 into one of the largest and most successful private wine producers in the country (consider Porcupine Ridge and Wolftrap, not to mention Chocolate Block), as well as one of the finest. 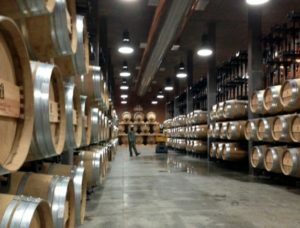 New barrel cellar at Boekenhoutskloof. Winemaker Gottfried Mocke is already rather blasé about riding around on his machine with which he can rise and attend to barrels on their – as yet – three levels (two more to come), each barrel capable of being independently moved without disturbing the others. He says it’s all working well, and to the outsider it’s certainly impressive. Typical of Marc Kent’s Boekenhoutskloof, every detail has been considered, not least from an aesthetic position. Anthony Lane’s sculpture at Boekenhoutskloof. 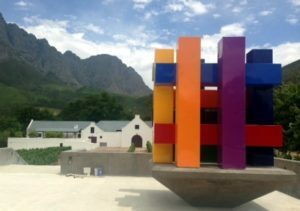 Talking of which – did you know that Anthony Lane, the famous designer of so many South African wine labels, also has a reputation as a sculptor? He has, and a large multicoloured metal sculpture of his, rather like an uncommitted Rubik’s Cube, sits on the barrel cellar roof. The most interesting new(ish) thing at Boekenhoutskloof is, of course, Gottfried Mocke himself (I could also mention the even newer arrival of his assistant, Eben Meiring). I had the privilege of tasting with Gotfried though the 2016 Boekenhoutskloof wines, due for release later this year – the first vintage for which he has been entirely responsible (though one mustn’t forget that Marc Kent still exercises a cellarmaster’s role in responsibility for the final blends). Gottfried arrived once the 2015s had already been vinified, to take them through their elevage to bottling, but the 2016s are from grapes that he himself ushered into the cellar. Especially as the wines are not deemed ready for release yet, let alone available, let alone ready for drinking, this isn’t the place to go into detail, but certainly Gottfried deserves – unsurprisingly – congratulations on his first Boekenhoutskloof range. Interestingly, there’s a new wine (but I’m not sure what label it will appear under), an impressive, still very tight and restrained chenin blanc from an old block on Goldmine, the Boekenhoutskloof property on the Riebeekberg slopes in the Swartland. It was quite a big, powerful vintage for the reds, was 2016. The Syrah (80% from Porseleinberg vines, 20% from the abovementioned Goldmine) is beautifully bone-dry, and seems more tannic than the 2015. About a quarter wholebunch fruit, two thirds matured in foudres. To say it needs time is to understate, but it looks very promising. The two cabernets are also formidable in early youth, Stellenbosch more drily austere and classic, perhaps, while Franschhoek has a dark amplitude and rounder tannic structure – and little obvious evidence of its all-new oak elevage. I tasted them blind, and told Gottfried I’d largely decide on the basis of the one I preferred probably being the Franschhoek (going by previous vintages). It was. But the wine that I probably most admired (well, it was certainly the most approachable too) was the Semillon, from three old Franschhoek blocks as usual. Gottfried’s managed to contain the oak that this wine sometimes shows in infancy, and it already has a subtly expressive perfume. The structure is also delicate – both steely and lacy. It’s going to be a wonder. In the interests of openness, I should make it clear that I have some personal friendship with Marc Kent, and was staying as his guest in the cottage at Boekenhoutkloof. Previous articleWin a six-bottle mixed case of Chardonnay!